It’s the last Tuesday of the month and you know what that means – Progressive Eats! Progressive Eats is our monthly virtual progressive dinner party. If you’re unfamiliar with the concept, a progressive dinner involves going from house to house, enjoying a different course at each location. With Progressive Eats, a theme is chosen each month, members share recipes suitable for the designated occasion, and then you hop from blog to blog to check them out. We have a core group of 12 bloggers coordinated by Barb at Creative Culinary. This month’s theme, Great Holiday Desserts, is hosted by Jenni Field at Pastry Chef Online. You won’t believe the selection of cookies, cakes, pies and more that we’re sharing with you this month. 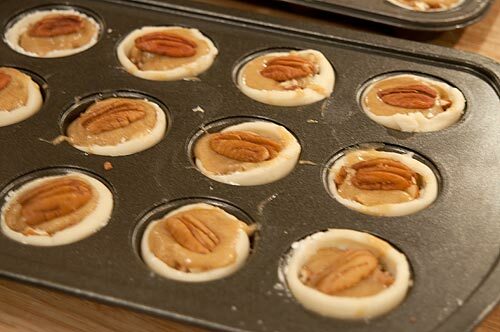 My choice for Great Holiday Desserts is Pecan Tassies. A tassie (which is derived from a Scots word meaning “small cup”) is simply a miniature tart. 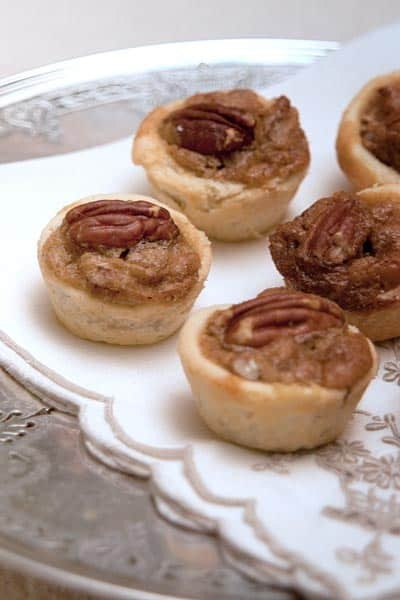 There are lots of different kinds, but the pecan tassie is one of my favorites. It’s essentially a two-bite pecan pie. I ask you – how can that be bad? I hope you enjoy these and maybe add them to your holiday baking list. I’ve included links to other recipes for tassies at the bottom of the post as well as links to all the other bloggers’ posts in this month’s Progressive Eats event. 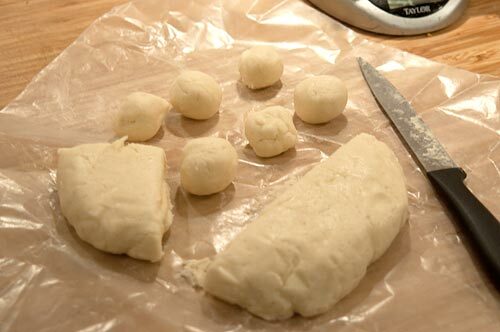 Begin by making the tart shell dough. 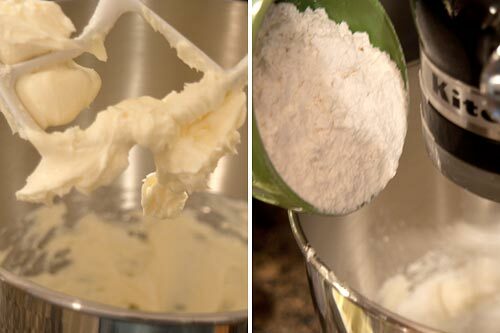 Add the butter and cream cheese to a large mixing bowl and beat with an electric mixer until creamy. Turn the mixer to its lowest speed and gradually add the flour mixing until thoroughly combined. 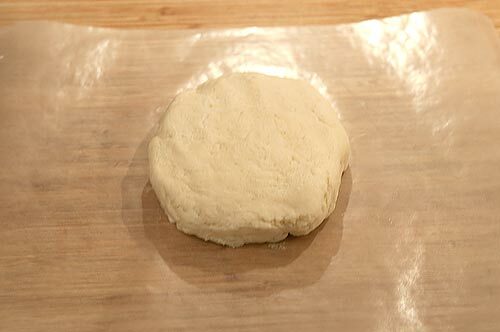 Form the dough into a round and wrap in plastic wrap or waxed paper. Refrigerate for one hour. Preheat the oven to 350 degrees. Spray 24 miniature muffin cups with cooking spray. Place one ball of tart shell dough into each muffin cup. Press with a tamper or use your fingers to form a shell. If you’re using a tamper, be sure to twist while pressing straight down to get the prettiest shape. 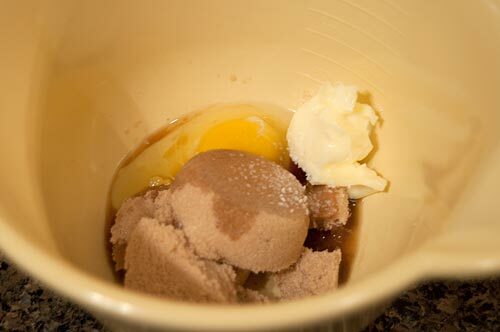 In a medium bowl, combine the light brown sugar, egg, butter, vanilla, and salt. Mix well. In each tart shell, place one teaspoon of chopped pecans. Top with one teaspoon of the brown sugar filling mixture and one pecan half. Bake for 20 minutes or until the filling is set. Remove from oven and cool completely on a wire rack. A traditional southern holiday recipe. 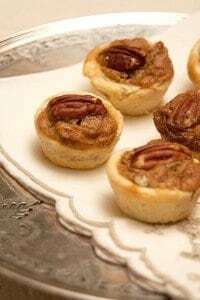 Rich, buttery tart shells filled with pecans, brown sugar, and butter. Begin by making the tart shell dough. Add the butter and cream cheese to a large mixing bowl and beat with an electric mixer until creamy. Turn the mixer to lowest speed and gradually add the flour mixing until thoroughly combined. Preheat the oven to 350 degrees. Spray 24 miniature muffin cups with cooking spray. 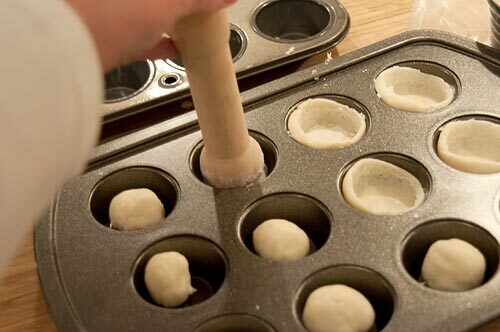 Place one ball of tart shell dough into each muffin cup and press with a tamper or use your fingers to form a shell. 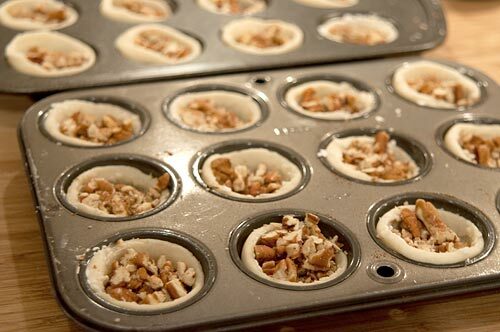 In each tart shell, place one teaspoon of chopped pecans and one teaspoon of brown sugar filling mixture. Top with one pecan half. Bake for 20 minutes or until filling is set. Remove from oven and cool completely on a wire rack. Follow all the links below to visit the blogs of this month’s participants. There are some delicious recipes in this list! This month’s theme is Great Holiday Desserts hosted by Jenni Field at Pastry Chef Online. Cookies, cakes, pies and more for your holiday party planning! Perfect little southern bites. Love them! Thanks Jenni! They’re an old favorite for sure. Love how cute these bite-size treats are – someone at our annual cookie exchange used to make these – so good! Looks luscious. Where did you get the tamper? Tassies have been part of my holiday baking for many years. I cannot make a pecan pie to save my life.. I keep trying and keep throwing them away. I’ve never made tassies before, but these are so cute! Ah, I never knew what Tassies were! They look so delicious and fun to make and eat. And I am nuts (ha ha) for pecans! Bookmarked! 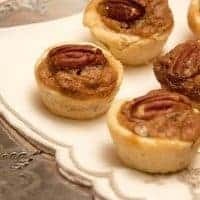 We have a few pecan trees on the ranch and these sweet treats are on my list to make with my fresh pecans! Geez these look right up my taste bud alley. I have a pan like that. Where did I put it? I realize I haven’t seen it for a while. This is what happens when you reorganize you kitchen a year ago and have kind of forgot the ‘oh what a good idea’ spots for things.